We pride ourselves on offering not only exceptional technical HVAC services, but outstanding customer service as well. A big part of doing so is simply being honest with our clients—though that is not always so simple for certain contractors out there. It is with this goal of honest communication in mind that we have to admit that there is no way to guarantee a problem-free experience with your AC. Even the best-maintained systems are going to run into trouble eventually. One common instance of trouble—and a very serious one, at that—is the refrigerant leak. A proper refrigerant charge is absolutely integral to getting the outstanding performance that you deserve from your home cooling system. 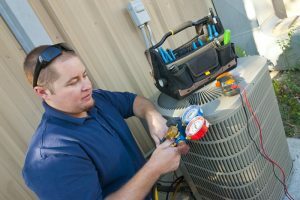 If you do have a leak, then you need prompt and professional air conditioning repair in Plainfield, IL. This begs the question of how you can spot a refrigerant leak. Well, we’ve got some tips to help you recognize the signs of trouble associated with the problem. When some people hear that they have a low refrigerant level in their air conditioning systems, they figure that they just need to have more added. Well, you do need to have the system recharged to the appropriate level, but you also have to understand that a low refrigerant level is not a normal scenario. Your system does not consume refrigerant, but recycles it through the system over and over again. That means that your system was either improperly charged to begin with—certainly not the case if we did the job—or it has a leak. Your system’s refrigerant is evaporated in the indoor evaporator coil, which allows it to draw heat out of the air. That cooled air is then redistributed throughout the house, while the warmed refrigerant heads out to the condenser coil in order release its heat as it is condensed. That cycle repeats until desired temperatures are met throughout your home. You are not going to see a pool of refrigerant lying around your air conditioner. What you may see is a pool of water, though. This often catches homeowners off guard. After all, unless you’re using an evaporative cooler (not likely around here), your AC system does not use water in its operation. What you are actually seeing may be melted ice, as a low refrigerant charge can lead to the icing of your evaporator coil. You may also see a spike in your cooling costs, as a low refrigerant charge will definitely drag down the energy efficiency with which your system operates. You might also notice longer run times, or you may find that your air conditioner is just running in such short bursts. That short cycling could mean that there is enough strain to cause your system to overheat, leading it to shut down in order to avoid system damages. Whatever the case, you need a professional to assess your system and resolve any problems before serious damage is done. Schedule your AC services with DuAll Heating & Cooling.